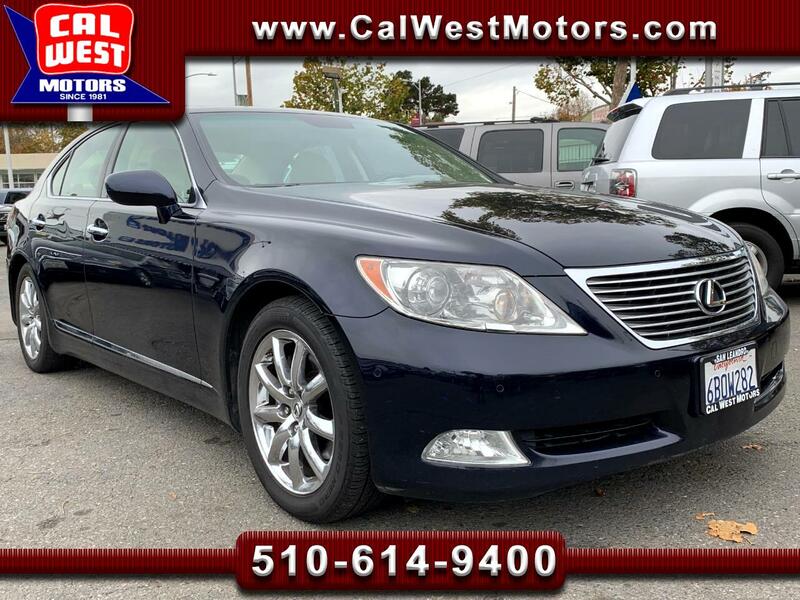 California owned Lexus LS460 with only 72,152 miles! Excellent maintenance history with zero accidents or damages! Our LS 460 is quietly but very capably powered by a 4.6-liter V8 that makes 380 horsepower paired to an automatic transmission with overdrive. Such a plush ride, drivers and passengers will find themselves ensconced in a bubble of serenity. Original Black Sapphire pearl paint. The cabin is just brilliant in an aesthetic sense with beautiful Cashmere colored leather upholstery with no rips or tears and genuine wood trim. Features include; key-less ignition, adaptive xenon headlights, power moonroof, dual-zone automatic climate control, power and heated front seats, rear heated seats, rear vanity mirrors, a hard drive-based navigation system with real-time traffic, backup camera, power rear window shade, power windows, locks and mirrors working properly. Bluetooth phone connectivity. Factory CD stereo with premium 19-speaker Mark Levinson surround sound system with Aux port. Lexus Link emergency communications system. Homelink programmable garage door opener. The trunk, for which Lexus offers a power lid-closing feature, can hold 18 cubic feet of cargo. 18' Lexus chrome alloy wheels wrapped in Great Quality Pirelli P Zero Hero tires. With this Lexus' Low Mileage, Outstanding Features and Amazing Condition makes for Exceptional Value under $17,000! Why Buy from Cal West Motors? 1) Experience -- Our 39th year in business in downtown San Leandro. 2) Our Vehicles are Independently Inspected and Pass an extensive Pre-Sale Inspection. 3) All vehicles have Passed CA Emissions (SMOG) Tests. 3) We're CarFax Advantage Dealers -- CarFax Vehicle History Reports are linked Free of Charge to our www.calwestmotors.com web pages. 4) We offer Extended Service Contracts on most of our vehicles from 3 Months to 5 Years of Coverage. 5) We will take your Trade-in and Accept your Credit Cards. 6) We will arrange Bank Interest Rate Financing as low as 4.99% on approved credit or Special Financing for those with Challenged Credit and Buy Here Pay Here when qualifications do not meet bank criteria. 7) We are A+ Rated by the Better Business Bureau. 8) We're Ethical and adhere to the California Independent Automobile Dealers Association "Code of Ethics". 9) We're Family owned and operated through 3 generations. 10) We offer a 48 Hour Contract Cancellation Option, Money Back Guarantee. 11) We won the Independent Automobile Dealers Association of California highest honor -- "2013 Quality Dealer Award". CALL Matt, Brian or Mike at 510-614-9400 for a NO HASSLE Car Buying Experience. CAL WEST TRADES BEST ! Vehicle prices are subject to change.